With the sound of “Pomp and Circumstance” ringing in their ears, the graduates of 2013 will be marching up to the stage and on to their future. There is a sense of accomplishment, pride and even relief at graduations because the participants feel they have completed something important. Texas Back Institute congratulates every graduate! With graduations, it seems as if something has concluded, when in fact the term “commencement” suggests a beginning. This idea of “conclusion vs. commencement” has of course been employed by more than one valedictorian in their one, final address to their esteemed classmates. This is the time of year when seniors in high school and college who have completed their courses successfully are awarded diplomas. This tradition goes back to the 11th Century when medieval colleges in Paris and Bologna reportedly began this practice. Over the centuries, the traditions have evolved and changed, but many have remained remarkably similar to the original ceremonies. The students, who were known as apprentices in these early graduations, learned skills from the masters of the crafts and to note this accomplishment, they were give a “testimonial of skill,” now known as a degree. The song that most of us associate with graduation ceremonies – “Pomp and Circumstance” – is a relatively new wrinkle on this ancient celebration. It was written by Sir Edward Elgar and first performed in Liverpool, England in 1901. Its melody, a combination of solemnity and dogged determination, is the perfect accompaniment to purposeful marching of the soon-to-be graduates. Another interesting graduation ceremony tradition involves the attire of the honored matriculates. The cap and gown, which is worn by students and (in some cases) faculty, was once called a “hood” and this is believed to be dated back to ancient Celtic Groups. Capes and hoods were worn by the Druid priests to symbolize their higher intelligence. After the music finally stops, the mortar boards are tossed and the diplomas are filed away, what happens then? 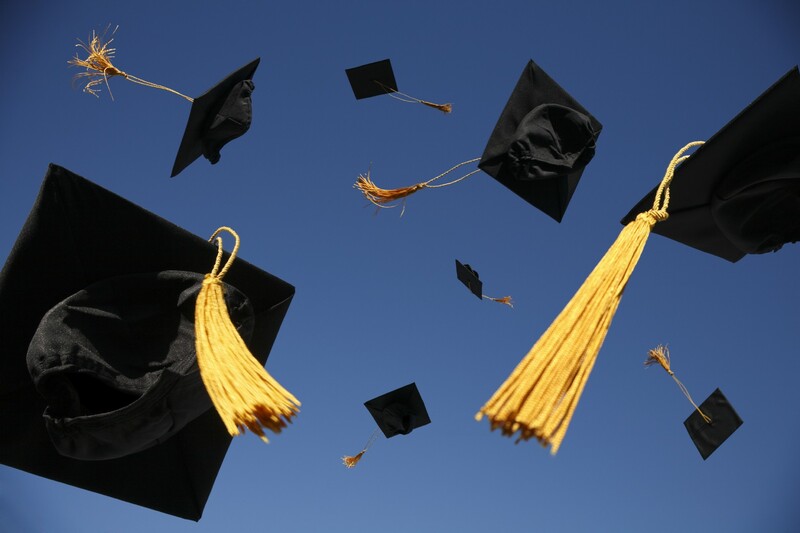 The graduate – of high school or college – must commence the next stage of his or her life. For many, this means getting more education and beginning the process of deciphering how to spend the rest of one’s life. Texas Back Institute is internationally known for its state of the art treatment of neck and back injuries, back pain, scoliosis, artificial disc replacement, occupational and sports medicine and its exemplary physical therapy practice. However, for the past 27 years, Texas Back Institute, led by one of the organization’s founding partners, Dr. Richard Guyer, has offered a select group of medical school residents a remarkable opportunity – a one-year fellowship to focus on spine surgery. To anyone talking with Dr. Guyer about the Texas Back Institute fellowship program, it is immediately obvious that he is just as enthusiastic as the young doctors who are chosen for the program. Much like the master craftsmen who trained the apprentices in earliest institutions of learning, there is a commitment to teaching these future surgeons that goes beyond cursory. The doctors who emerge from this program are changed forever. With his interest in teaching, we thought Dr. Guyer might be a good source of advice for graduates of any level – high school, college or graduate school. Here is that conversation. What areas of medicine will be in high-demand in the coming years? There are so many opportunities in medicine, especially if a young man or woman is interested in computers, science or engineering. We’ve all read that more and more kids are interested in business, finance or high technology, but the opportunities in medicine are exploding. For example, the latest high tech robotic surgery equipment is still directed by a human who is a trained physician and many of the best practitioners of this specialty were video gamers when they were kids. Genetic engineering is going to be a very hot area of medicine in the coming years and this specialty requires a very analytical mind which many youngsters who are good at math and science possess. If someone is graduating from college and accepted to medical school, what types of specialization might they consider for spine surgery or other specialties offered by Texas Back Institute? When I first started in medicine, young physicians would spend a couple of years in medical school before they decided which specialty interested them. Things have changed a lot since then and now that decision is often made when they are in college. The types of procedures we do at Texas Back Institute involve a wide range of medicine. We handle spine surgery for both children and adults. Our doctors deal with trauma surgery which would be required for automobile accidents and other accidents. We treat injuries that are the result of aging – wear and tear damage. We also have quite a few sports injuries that our physicians treat. So you can see there is a wide range of opportunities just in the spine area. How did the Texas Back Institute Fellowship program come about? I’ve found that when you teach students, you learn as much as they do and I loved teaching. In the mid 80s, I approached my colleagues here and shared my passion about teaching. I mentioned that I’d really like to build a fellowship program here for residents who wanted to specialize in spine surgery. Since our beginning in 1986, we have trained more than 100 fellows and I have been the chairman of this program for 27 years. This keeps me young and sharp! We work hard at sharing the latest research and techniques about spine surgery for these young doctors and for everyone on the Texas Back Institute staff it is very gratifying when that light bulb comes on over the head of these talented young people. How does the TBI fellowship program work? These doctors have been through medical school and have completed their residency program. They find us through the network of former TBI fellows and through the American Academy of Orthopedic Medicine. 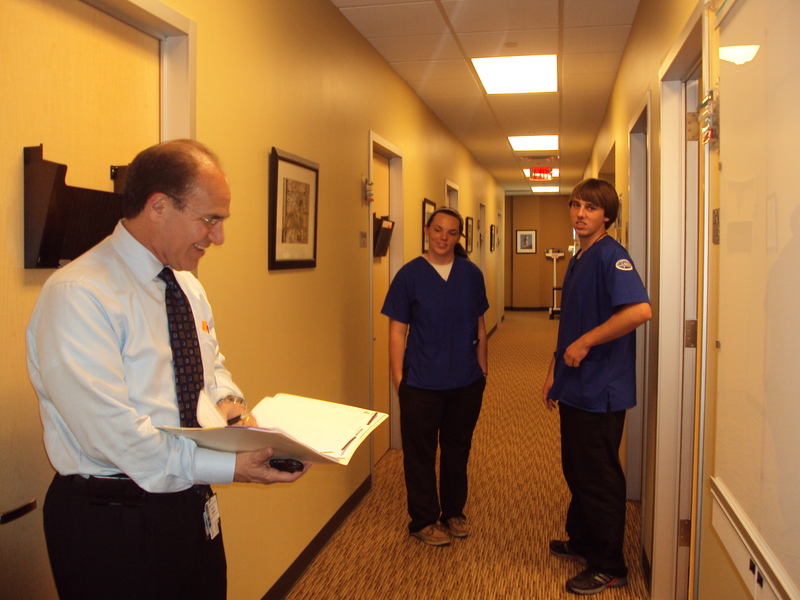 Once they are accepted to the fellowship program, they work with all of the surgeons on our staff. 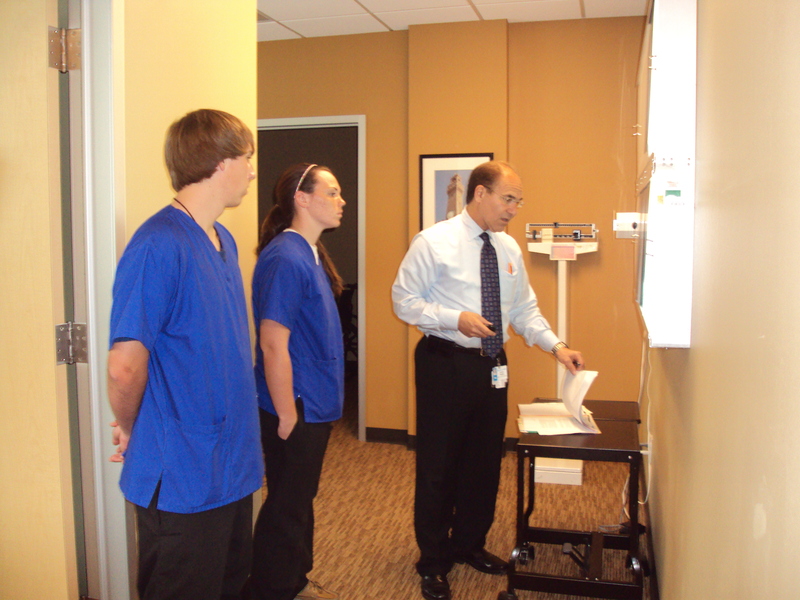 They get hands-on training in deformative and degenerative medical issues, trauma, tumors and disc replacement surgery. What are the criteria that Texas Back Institute uses to recruit new physicians to the practice? Does completing your fellowship help in gaining a position? The last 4 or 5 physicians that we have hired have gone through the Texas Back Institute Fellowship program, so that suggests that there is an advantage of going through this training. When we recruit new doctors for our team, we look for a young woman or man with a high degree of intelligence, an excellent bedside manner, his or her ability to synthesize a large amount of information and apply it to treatment and most importantly we look for integrity. From Left to Right: Dr. Rey Bosita, Dr. Rajesh Arakal, Dr. Jack Zigler, Dr. Jason Sparks (Fellow), Dr. Richard Guyer, Dr. Ralph Rashbaum, Dr. Troy Morrison (Fellow), Dr. Kirill Ilalov (Fellow), Dr. Michael Duffy, Dr. Kenny Edwards (Fellow), Dr. Andrew Block, and Dr. Dan Bradley. Successfully completing a course of study and celebrating this accomplishment with friends and family is one of life’s great pleasures. As speakers who are chosen to impart wisdom to a group of graduates are fond of noting, this ceremony is not the conclusion, it is the beginning. Congratulations to every graduate and their families. Now, let’s get busy! As a professional bass fisherman, Ryan’s pain was exacerbated by his participation in several fishing tournaments every year. In order to win or place in these professional bass fishing tournaments, the angler must catch as many bass as possible with the idea being that the final fish weight of his top 5 fish are compared to the other participants. The fishing tournament typically lasts for two days and the more fish that are caught, the higher probability of getting 5 huge ones. This requires lots of casts. How many? 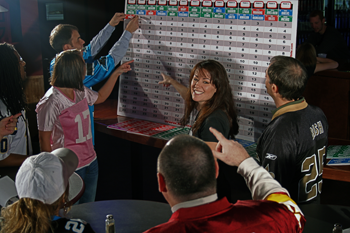 “I typically cast 3,000 to 3,500 casts each day of a tournament,” Lovelace said. Standing on his feet for about 8 hours and casting 3,000 times a day during a tournament took its toll on Ryan’s injured back. Over time, it wore down his L5 vertebra and Dr. Richard Guyer at Texas Back Institute recommended a microdiscectomy. After this procedure was completed, Ryan spent less than 24 hours in the hospital for recovery and was sent home for rest and further rehabilitation. A short while after his operation, Ryan is getting back to his top fishing form. He hopes to be completely recovered and able to compete in the 2013 pro bass fishing season. Many people assume that if they are going to see a spine surgeon that they are going to need surgery. This couldn’t be further than the truth. Actually, 90% of the people with back pain and/or neck pain will recover without surgical intervention. Therapy, medication management and injections are all conservative treatment options which are explored. 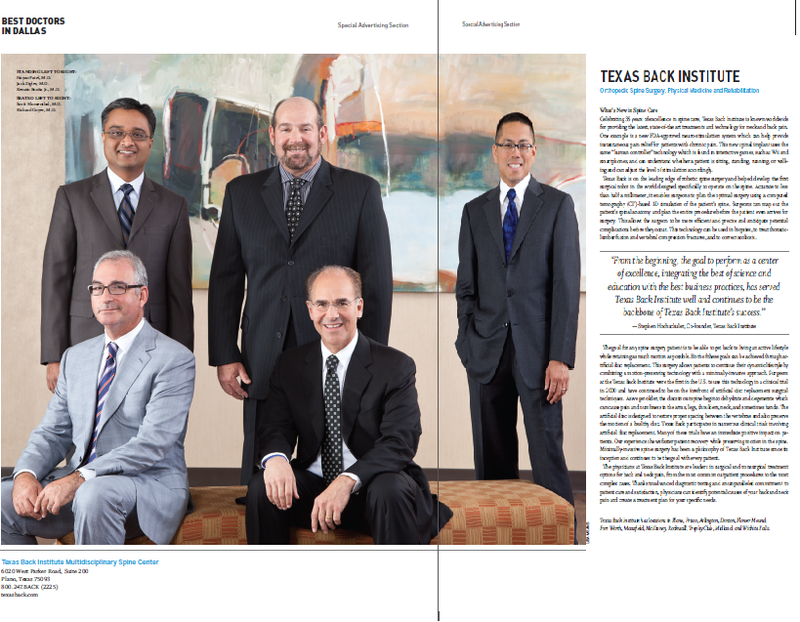 At the Texas Back Institute we want you to get the most out of your appointment with one of our spine surgeons. Dr. Richard Guyer, orthopedic spine surgeon and founding partner of Texas Back Institute in Dallas, TX tells us what questions you should ask your surgeon and what you should know before making the decision to have spine surgery. Ask your surgeon to clearly explain your diagnosis. Make sure you understand your diagnosis, exactly what your diagnosis means, and what your treatment options are. Ask your surgeon what conservative treatment options are available. Exhaust all conservative treatment options before considering surgery, including medication management, physical therapy and injections. Ask your surgeon if you really need surgery. Know what the progression of your condition may be. Make sure you know what makes a patient a good candidate for the surgery you are considering, and if you fit the criteria. Find out if there is a minimally invasive option for your surgery. Ask the basic complications of any surgery. This includes the expected infection rate, the expected chance of injury to the nerve, the expected relief of pain and recovery of nerve function. Ask what your recovery will be like. What will your activities immediately after surgery and in the weeks after surgery be like? Overall, we want to make sure that all our patients have their questions answered and are comfortable with their decision to have spine surgery. If you have specific questions that you would like answered please visit http://www.texasback.com/ask_the_doctor and submit your questions. We look forward to hearing from you! For Vickie Money of Venus, Texas, mopping the floor was a simple, routine task she was doing on another ordinary day. But something unusual happened, and suddenly she found herself suffering from severe pain in her lower back that would impact her life for several years to come. At the time, Vickie was only 46 years old, and she first treated the problem with physical therapy, pain injections and pain medication for several years. But nothing helped relieve her of a pain so severe that her activity had become limited to nothing more than sitting or lying down most of the time. Finally, several years later, she went to Texas Back Institute and was examined by Dr. Richard Guyer. 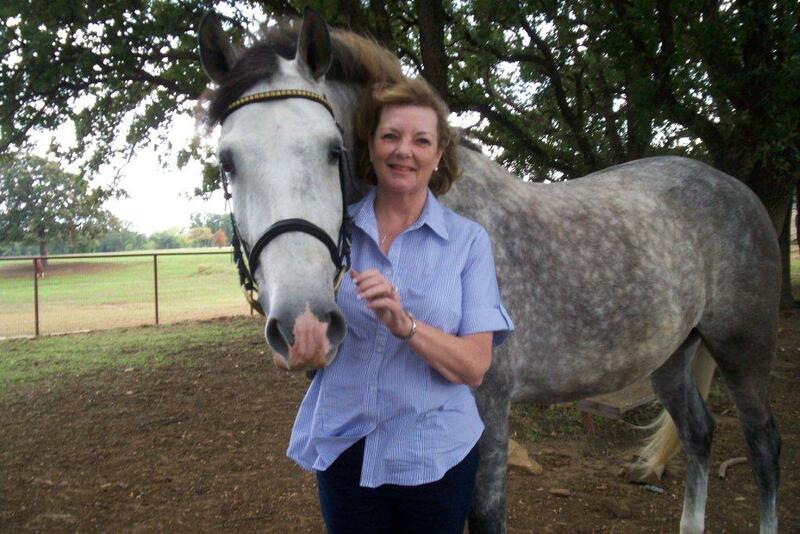 Now at the age of 53, Vickie learned she needed surgery to help alleviate the pain. She was understandably concerned as to whether or not the surgery would help or make the problem worse and, if she did gain some relief, she worried how long it would last. Under Dr. Guyer’s care, Vickie underwent a 360 fusion surgery on her L4 and L5 vertebrae to correct the problem and get her life moving forward again. Hoping for even the slightest pain relief, she was more than pleased to gain relief of about 80%. Looking back, Vickie repeats what many Texas Back Institute patients advise others: don’t wait to do something about your back pain. I want to be a doctor when I grow up! Texas Back Institute was built on the foundation of patient care, research and education, so of course when one of the local high schools asked us if we would let a couple of students shadow one of our surgeons, we were all for it! Dr. Guyer, one of the founders of TBI and one of the co-directors for our fellowship program, jumped at the opportunity to share his passion with two young students. They spent the day by Dr. Guyer’s side, learning what it takes to diagnose and treat back and neck pain and what it takes to be a compassionate doctor. Here are a couple of photos from the day! 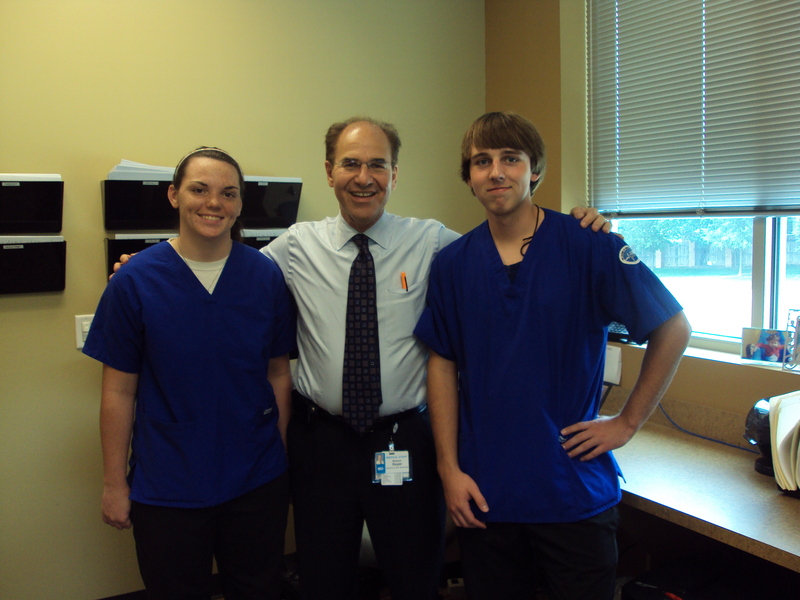 Dr. Guyer with his two students. A couple of action shots! We had such a great time and are so happy we were able to do this! Did you ever think you wanted to be a doctor? What either got you there or changed your mind?